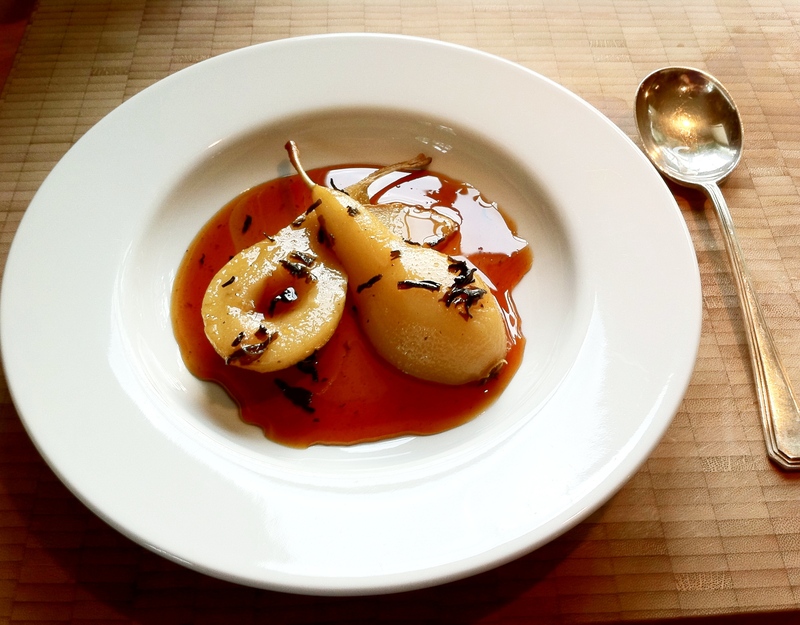 Poached pears in jasmine tea. Put your tea leaves into a kettle or large bowl and pour the boiling water over it. Allow the tea to brew for about 3-5 minutes. Strain the tea into a saucepan over a medium heat, add your fresh ginger slices and the rock sugar. Retain just a teaspoon of the leaves in a dish and throw the rest away. When the rock sugar has dissolved, put your pears into the liquid and turn it to a gentle simmer. Poach your pears for about 20-30 minutes. When your pears are cooked through, lift them out with a slotted spoon and place to one side. Remove the ginger slices too. Turn the heat up on your poaching tea liquid and boil briskly. It takes about 20-30minutes to reduce the liquid by half, leaving you with a nice tea syrup. When you’re ready to serve the pears, scatter some of the tea leaves on the pears or around your plate, and pour 1-2 tablespoons of your reduced tea syrup over the pears. (You may need to re-heat the pears by zapping them in the microwave for 30 seconds just to warm them up again). I like serving them as they are but you could serve it with a small ball of plain vanilla or coconut ice cream, or a tiny drizzle of coconut cream.